Battle Game of the Month: Mighty Pretty But kin they fight? Mighty Pretty But kin they fight? 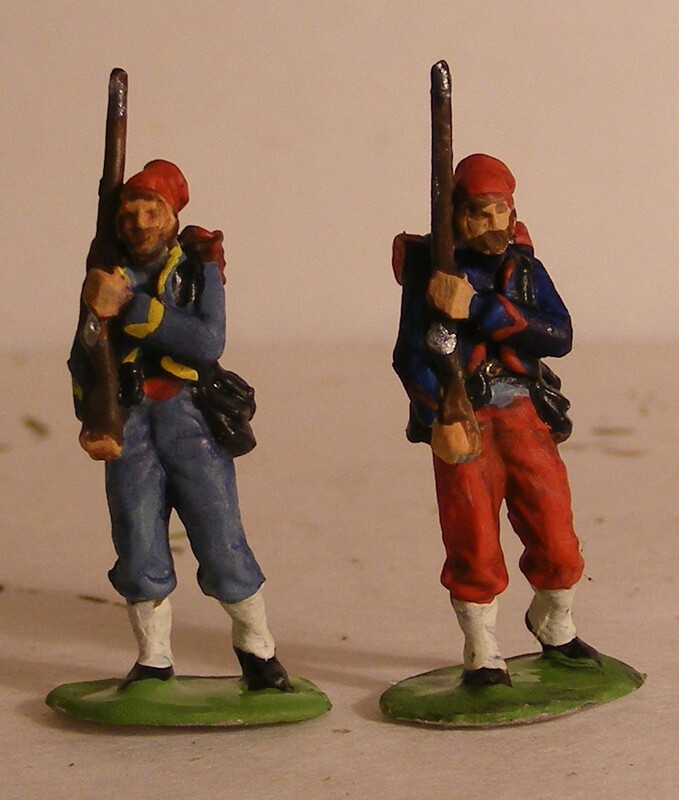 One of the things my 1/72nd ACW armies lack is Zouaves. I've been dragging my feet about ordering some but suddenly long time blog reader Cesar emailed some pictures of some castings he had just made of a 1/72nd ACW Zouave conversion and would I like some? Would I!!!!. Well, they arrived yesterday (good postal service from Argentina!) and having looked at these exquisite jewels of a figure, perfectly cast, applied my usual patience, and ......I now have one regiment primed and a sample of each of the 2 proposed regiments painted. No question, they are pretty, but I have a feeling they will also be able to fight. 1/72nd ACW Zouaves cast by Cesar, painted by me. Cesar will be known to Yahoo OS Wargaming members and in addition to leaving comments here, he has also contributed a guest post dispatches-from-field . If you click that link in addition to his battle report, there is a link to some online photo albums with pictures of Cesar's figures in various scales. The generosity of my fellow enthusiasts never ceases to impress me. Now those troops will add a splash of color and dash to the ol' tabletop! They are fine looking figures as well. Can a unit of Louisiana Tigers be far behind?! So far behind that they can't be seen. I was very attached to my 15mm Battle Honours Tigers who are now gone, not ready to do them again. Thank you very much for your kind words Ross. I really appreciate your comments on my figures. I am very happy you found a place for them in your armies. I like the uniforms you chose and the painted samples look wonderful! I don´t know if they will fight well but I am sure with those colorful uniforms they will attract a good amount of enemy bullets! I am sure they will be in the fore front. That is pair of fine looking Zoauves. I'm very pleased to add them. They look good, Ross. Hats off to Cesar for the figures and you for the painting. Very nice, Cesar is a talented man and a really nice guy too. Lovely figs. Lets hope they fight as good as they look. I'm in awe of how you and many other wargamers make and present such lovely castings. I've done it with mixed results, and it's work. It's hot, smokey if the metal is recycled bits, it can be dangerous (I had a spitting mold almost take me out-Don Featherstone was right, put the plaster in a warm oven or a while before casting) and that shiny pile needs trimming and filing afterward. I've never been brave enough to try plaster moulds for soldiers, strictly rtv. For Death or a Promotion. When all else fails, try logic.